Using Bob Dylan’s song catalog, the Irish playwright Conor McPherson has written a play with music set in America. And to hear him tell it, and his characters sing it, we the people of the United States have absolutely no sense of humor. I guess it takes a lot to laugh, because the characters of Girl From the North Country — which collected a couple of acting Olivier Awards in London and has now turned up stateside at the Public — never do. The play is a somber, self-serious affair. In searching for the soul in Dylan’s tunes, McPherson, who also directs the show, and his orchestrator and arranger Simon Hale have consistently sapped them of their mischievous spark. The tone is mournful, almost devout — a funeral without a wake — which feels downright strange coming from McPherson, a writer whose plays set in his homeland (The Seafarer, The Weir, Shining City, etc.) venture down dark, winding paths, but simultaneously bristle with vitality, the laughter that pokes star-holes in the night. Despite a few attempts at energetic crowd scenes, Girl From the North Country never quite stops feeling like a dirge, and though its large cast is full of marvelous singers, their individual characters are less real people than they are a hodgepodge of archetypal Americana. The show is a doleful patchwork of literary tropes and maudlin arrangements that make listening to Bob Dylan feel like going to church: Its creators have taken away his essential playfulness, and in doing so have dulled much of his power. Neither a bio-play nor a straight jukebox musical, Girl From the North Country weaves twenty-some Dylan songs into the story of a group of lonely drifters and misfits inhabiting a boardinghouse in Duluth, Minnesota during the Great Depression. (Dylan was born in Duluth, as Robert Allen Zimmerman, in 1941, seven years after the action of the play.) With a few exceptions, songs don’t spring out of characters’ mouths as direct extensions of the action, and considering the enigmatic, image-rich lyrics — which tend to mask the character of their narrator — how could they? Mercifully, McPherson doesn’t literalize Dylan’s weird poetry: there are no guilty undertakers or lonesome organ grinders on stage. Instead, he tends to use the songs as tonal commentary, poetic complements to the unfolding action, often delivered by characters who aren’t directly involved in it. The music feels like a manifestation of subtext, of all the unspoken suffering of this band of lonely hearts in the frozen Midwest. Which is fine in theory, except that the tone is overwhelmingly static and morose. Hale has cranked down the tempos and added choruses of keening harmonies, and McPherson has instructed his actors to play everything straight, sad, and soaring. They all make brave attempts to gaze into the middle distance and sing down the hurt, and they’re all superb vocalists (assisted by the lovely work of sound designer Simon Baker, who gives their voices a haunting edge of reverb) — but after four or five songs have rolled by, you’d think all that Bob Dylan ever wrote were laments. When the boardinghouse owner’s son, a young would-be writer named Gene (Colton Ryan), began the world’s slowest, most forlorn version of “I Want You” after being rejected by a young lady called Kate (Caitlin Houlahan), I couldn’t help wondering if we’d eventually be treated to a stately “Subterranean Homesick Blues” or a weepy “Rainy Day Women #12 & 35,” underlining how tragic it is that everybody must get stoned. Covers are difficult things — and covers of an artist with so much definitive, tricksterish personality, especially so — but the alchemy of Dylan’s songs is that the sad and weird are sadder and weirder because they’re lifted up by the quick and bright. Take away that friction and you end up with flint and no steel to strike it. I needn’t have worried about “Subterranean Homesick Blues” — almost nothing so vivacious, or so A-side, makes it into the show. Girl From the North Country features only three songs from the heyday of the ’60s (and one of them, the title track, is just a snippet, barely heard underneath dialogue). Instead, the show leans heavily on Dylan’s 1970s and ’80s catalogs, even venturing earnestly into his born-again Christian phase. Some of the songs stand out: Kimber Sprawl, as the boardinghouse owner’s adopted daughter, Marianne — who’s keeping tight-lipped about her pregnancy and whose father is trying to arrange a match for her with a much older man — has a gorgeously lilting voice and powerfully interprets “Tight Connection to My Heart (Has Anyone Seen My Love? )” And Sydney James Harcourt, who plays an on-the-lam boxer named Joe Scott, has a great feel for “Slow Train.” He also delivers, along with the ensemble, a robust “Hurricane” (the rare big hit and also, McPherson has admitted, given the character of Scott, one of Girl’s more on-the-nose songs). The women of the play gather around a microphone to do an eerie, beautifully harmonized version of “Jokerman,” and Mare Winningham — as Elizabeth Laine, the boardinghouse owner’s wife who’s flitting in and out of dementia — turns the score’s most iconic song, “Like a Rolling Stone,” into a cryptic anthem for all the story’s lost souls. The song works well not only because it’s a damn good one (much of Girl’s setlist is less incontestably great), but also because Elizabeth’s mental state keeps her from becoming sentimental. It gives her back some of Dylan’s original perceptive edge, some of the wise foolery that gets drowned in the plaintiveness of so many of the show’s other musical takes. What it doesn’t do, unfortunately, is go all the way towards making Elizabeth into a full, rich character. Winningham is a compelling performer — watching like a knowing, owl-eyed child as her sad husband carries on guiltily with one of the guests, or ritualistically dressing herself up in a kerchief, purse, and dark glasses, when she’ll never make it out the door. She does her best to give dimension to McPherson’s sketch of a woman whose fraying tether to reality is perhaps a kind of liberated defiance, almost a revenge on the world that’s brought her to this point and a subversive exit from it. But like all the other characters in Girl From the North Country, Elizabeth is little more than a sketch. McPherson seems to have cherry-picked his dramatis personae from across American literature and neglected to fill in the outlines. Elizabeth herself contains echoes of Mrs. Winemiller in Tennessee Williams’s Summer and Smoke, and the hostel full of outcasts feels like his Vieux Carré. Then there’s the Our-Town-stage-manager-like doctor (Robert Joy) — who fills us in on the story from across the footlights and eventually speaks to us from beyond the grave — and the gentle giant Elias Burke (Todd Almond), who conjures up Lenny from Of Mice and Men and who may or may not have done something terrible to a girl up north because he “didn’t know [his] own strength.” There’s the Hemingway-esque boxer, the O’Neill-esque aspiring writer, the Miller-esque failed businessman (Marc Kudisch), and the despairing boardinghouse proprietor (Stephen Bogardus). On the face of it, a collage of riffs on the American canon could be an interesting idea, but McPherson gives us little to latch on to below the surface of these human beings. Who is the girl from the north country? She could be the little sister of the proprietor, Nick, who, when they were children, fell down a mine when he was supposed to be looking out for her, and who seems to haunt Elizabeth. She could be a girl who was found dead in the woods last spring — the possible accidental victim of Elias. Or she could just be a song. In plays like The Weir, McPherson has used the shadows of his characters’ pasts to creepy, heart-wrenching effect, because he’s eventually allowed those shadows to coalesce for just long enough for us to recognize some solid, terrifying form. In Girl From the North Country, McPherson instead attempts repeatedly to have his sinister, melodramatic cake and eat it, too. He suggests lurid circumstances — like a psychosomatic pregnancy, or possibly even some kind of uncanny ravishment, involving Marianne, or at least two different potential familial murders — and then drops them back into the lukewarm pot of “could have been but wasn’t.” Things remain murky in Duluth, and the murk quickly gets dull. It seems perverse that characters singing Dylan songs — with all of their unmistakably idiosyncratic imagery — should fail to transcend archetype, and that their world should feel glazed over with melancholy ambiguity. But through force of both orchestration and storytelling, Girl’s men and women remain frustratingly flat, and so, despite the difficulty of their circumstances, we don’t really mourn for them. They’re all suffering — we get that much, it’s the Depression — but suffering on its own isn’t particularly interesting to watch. “How can you love someone who ain’t got a soul?” the desolate Nick asks his boarder, the warm-hearted widow Mrs. Neilsen (Jeannette Bayardelle), with whom he’s been having a pretty open, if not particularly steamy, affair. “You have a soul,” she tells him, but he shakes his head: “I don’t feel it.” The same goes for the play. It wants to have a soul, but ironically, inside all its serious aspiring soulfulness, we can’t quite feel it. 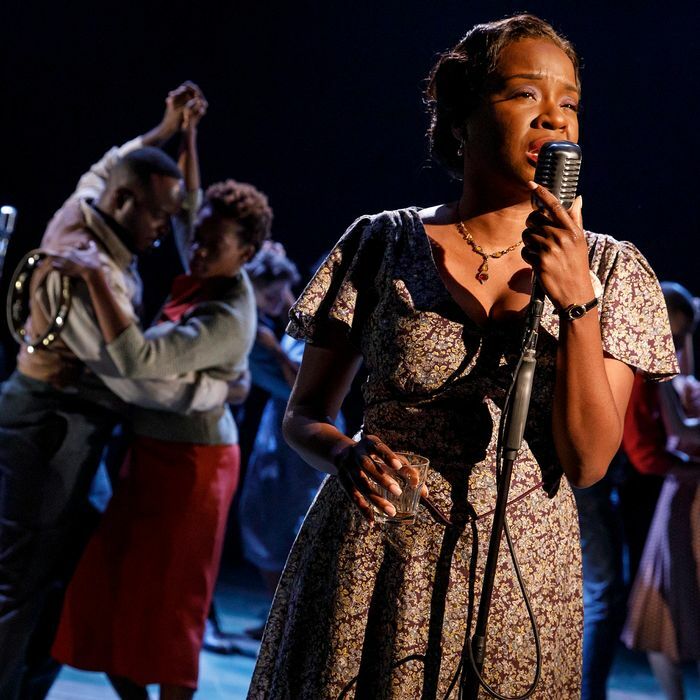 Girl From the North Country is at the Public Theater through December 23.